We've all done it. We're not sure of our password, so we make multiple attempts to log into an account, and after too many tries we get locked out. So when you get an email from your bank saying they've locked you out of your account for that very reason and you need to "verify your account" or lose permanent access, maybe you take it seriously. But watch out. There's an email phishing scam making the rounds using that ruse. If you click on the link you could download malware or, if you enter your real log-in, you could give the scammer access to your account. Any email purporting to be from a legitimate company should be analyzed carefully to make sure it is genuine. In the case of this email, a quick glance shows that it's bogus. 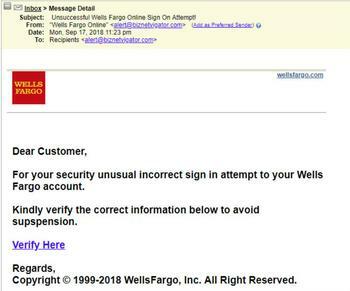 The message claims to be from Wells Fargo and reads "Dear Customer, For your security unusual incorrect sign in attempt to your Wells Fargo account. Kindly verify the correct information below to avoid supspension (sic). Verify Here," with "verify here" in the form of a link. The first sentence makes no sense and was not written by anyone in corporate communications. Notice that "suspension" is misspelled. We probably don't need any more proof that the email is a scam, but here it is anyway. Check out the email's header. It is not from a Wells Fargo address but from some strange email domain. 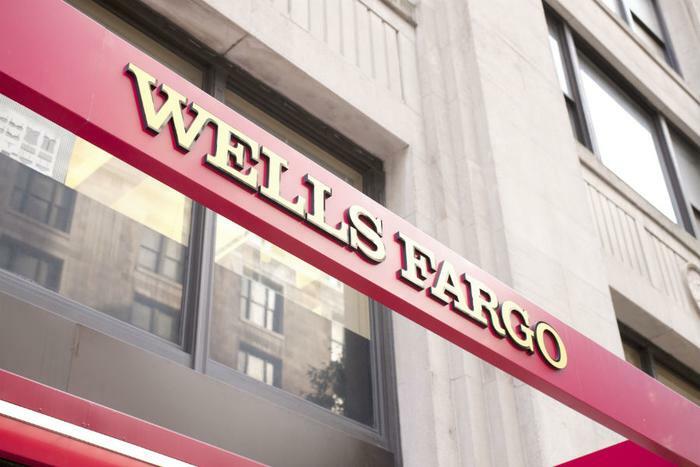 In the actual email, hovering the cursor over the link reveals its source -- again, not a Wells Fargo address but some odd domain, probably located halfway around the world. With ransomware and other exotic schemes, phishing scams tend to get overlooked. However, they're still plentiful because they work. By more closely examining you email, you can make sure they don't work on you.